I was born in a small town in British India. One of the bloodiest partitions in the history of the world took place in my country. In 1947, the British had finally left India, which led to a division of the country into India and Pakistan. The area where my family lived became Pakistan, but it didn’t happen easily. There were riots everywhere, and, when I was 5, we had to flee in the middle of the night to the coastal town of Karachi. After that, we were put on cargo ships, bound for Mumbai. My parents had been wealthy land and shop owners, and within days they had to leave everything behind. I remember my mother, Gopibai Hingorani, who had only completed a 4th grade education herself, telling me she was going to make sure I received something that no one could ever take away from me: an education. Despite the fact that we lived the next decade as refugees, my mother kept her promise. It wasn’t until I was 13 that I even heard the word engineer. The Prime Minister of India [Jawaharlal Nehru] visited my small city. He said, “after 200 years of British rule, India has no industry and that we need engineers. I’m not just talking to you boys,” he added. ‘I’m also talking to you girls.” I had found my calling. That day I went home and told my mom that I would become one of the first female engineers. I was the first woman admitted to the engineering college that I attended in India. Not surprisingly, that came with challenges. Besides being in a male dominated culture, there wasn’t even a ladies’ room on the campus. I had to ride my bike back and forth 1 1/2 miles (each way!) to use the restroom. Within a few months, however, the dean realized I was there to stay, so he had a ladies’ room built for me. At 19, I came across a biography of Henry Ford, and I started dreaming about one day working for the company he had built. After finishing college in India, my parents gave me their lifetime savings to help me fulfill my dream. It was hard on my family, but my mother was a visionary. She thought if one child gets educated, it would change the whole family’s fortune. She was right. Eventually, I was able to help my three younger siblings and my parents come to America. I arrived in the Motor City, Detroit, Mich., in January of 1967 without snow boots, a warm jacket, or a car. The first time I applied to Ford, I wasn’t hired, but I didn’t give up. When I tried again a few months later, the HR person was confused. He looked at my resume and said, “You’re applying for an engineering job, but we have no females here.” I told him, “I’m here, and unless you hire me, you’ll never have any.” It worked. I became the first female with a Masters in Engineering ever hired by the Ford Motor Company. While arranged marriages were still very common at that time, I actually met my future husband, Subhash, in the United States. It was what we call “a love marriage.” That was after I had landed my dream job. During my first pregnancy, my boss told me that I shouldn’t be working if I was showing. I returned to another position at Ford shortly after giving birth, and was promoted within three months. We have two sons, Sanjay and Suneel, who have achieved their own tremendous success. Sanjay is a practicing neurosurgeon and Chief Medical Correspondent for CNN. Suneel is a lawyer and MBA, and is presently running for U.S. Congress. 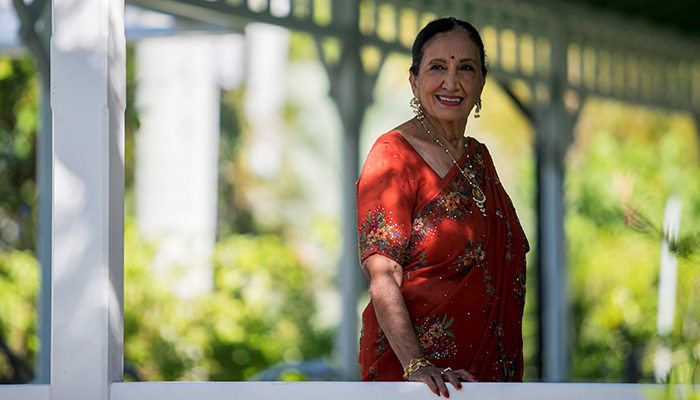 Gupta is retired from Ford and lives in Fort Myers, Fla. She and her husband play a lot of bridge, sing karaoke, and travel together.